Hello friends! My adventures with Deek just keep on keeping on! It's funny...when you live somewhere your whole life, you often don't visit the tourist spots or landmarks. Deek feels like he's fallen into that category in that he's never been to Mt. St. Helen's, hiking on Mt. Hood, kayaking, etc. Since I've come here, he wants to show me all there is to do and see in the lovely Pacific Northwest, and in doing so, he's getting to experience these things himself firsthand. This past weekend, we were supposed to go to a work function, but it got cancelled. So, we found ourselves with some free time we didn't expect. Deek and I looked at each other and said, "What sounds fun?" For Saturday, we decided on kayaking and Sunday hiking in Mt. Hood. I love how spontaneous Deek is. When you do what we do for a living--editing/marketing for BookFish Books from home for me and slinging code for Deek--it involves a lot of sitting. Some days, he comes home, and we're both like, "Let's go DO something." It can be as simple as a walk around the local outdoor shopping center or more complicated like hiking up a mountain. I really enjoy that about us. We just love to spend time together and have fun no matter what we do. I think the hardest part of kayaking is actually getting the boat down to the water and putting it in. We rented some kayaks and were given rolling wheels to take it down to the river. Well, these things are long and cumbersome, and we had to cross roads with them. It was actually quite comical. 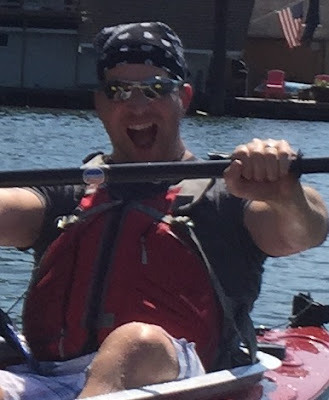 I'm left-handed, and the rental guy started me out pulling the kayak with my right hand. It felt really awkward, and I pushed the darn thing right into a bush. 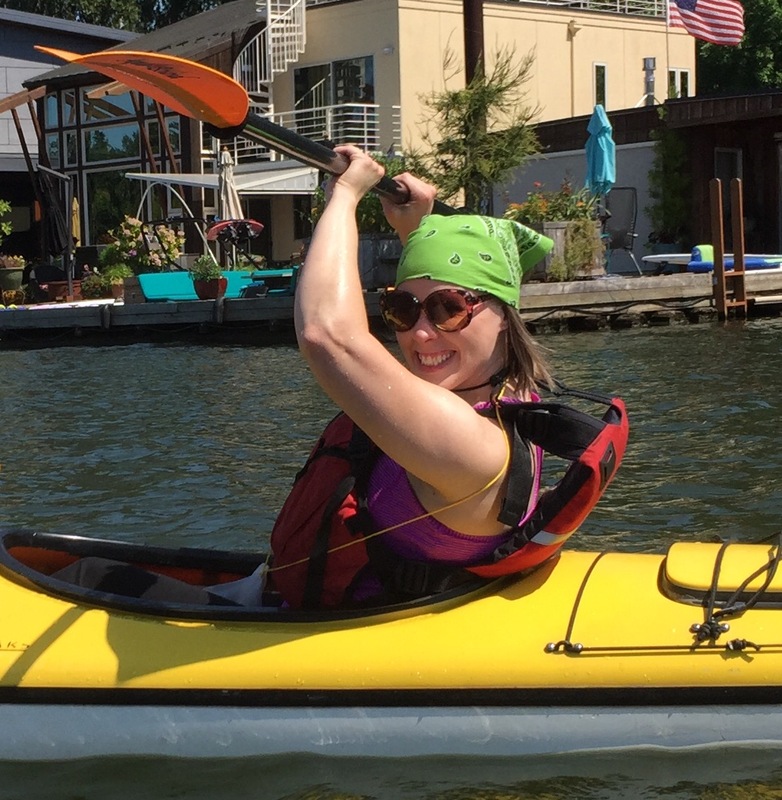 But once I switched and let my left hand control the kayak, it was effortless. When we got down to the water, we had to slip them off the wheels, lock the wheels to the dock, and then lower the kayak into the water over the side of the dock. Sliding it in down the dock would have damaged the bottom of the boat per the rental company. Those things are heavy, but Deek and I worked it like a boss. The day was hot, but once we were on the water, it felt great! Deek and I have been doing a lot of cardio lifting lately, so my arms and shoulders were totally up to the task of paddling. I was really proud of how well I did and how quickly I moved and maneuvered the boat. When I was a teen, I worked as a camp counselor at the YMCA, and we took the kids out on canoes all the time. I thought I loved canoeing, but I love kayaking even more!! Mmmmm...hawt man! Deek is SO FUN! I love his zeal for life! Gorgeous views on the river. There were these AMAZING houseboats we saw along the route. I can't imagine how cool that lifestyle would be! Strong arms and shoulders thanks to lifting. ROAR! On Sunday, we decided to hike to some waterfalls up on Mt. Hood. Due to an unusually warm winter and almost total lack of snow, the mountain looks a little like a wet cat. It's usually fuller than this. Since I moved to the Pacific Northwest, Mt. Hood has become my favorite mountain, and I search for it in every city we go to. I've taken countless pictures of it, but I've never actually been up on the mountain...until now. We took a 4.6 mile hike down one of the trails which houses two waterfalls. The first comes up quite quickly, but the other is much farther down the trail. The trail was very narrow and full of fine dirt, so we ended up covered in dust! Also, the hike to both waterfalls was labeled "easy," but I disagree. We had to do a lot of special maneuvering to get down to that second waterfall...but boy, was it worth it! The Pacific Northwest is known for micro-climates. For example, it can be sunny in one town and raining in the next town over. Well, the mountain had its own micro-climate. We were walking along in the sunshine and warmth, and then it started raining big, fat drops all of a sudden. When walked about ten more minutes, and the sunshine returned. So funny! Wow, totally handsome man in front of a gorgeous waterfall! One of my most favorite movies of all time is Tombstone, and one of my most favorite characters of all time is Val Kilmer's version of Doc Holliday. So, my sweet husband took me inside their little restaurant for dinner. And wowsa was it delicious! I mean, really and truly delicious. Thanks, Val/Doc for inspiring a great meal, and thank you to my thoughtful husband for taking me there just because I liked the name. Even if you've lived somewhere your whole life, I encourage you to go somewhere you've never been. Try out that tourist spot you always thought you'd find the time to see. Or go off the beaten path and try something only the locals know about. It's so fun to experience new things, enjoy your surroundings, and make memories with those you love. Thanks for being my partner in this and all things, Deek! I love you to the moon and back again. Or as you told me when you were really, really sleepy a few nights ago, "I love you to the dwarf planet Pluto and beyond."